The victory forced a decisive Game 3 at 6:05 Sunday night at Magness Arena in the National Collegiate Hockey Conference quarterfinals series. Denver battled back with its biggest star shining for two timely goals. Troy Terry was credited for the tying goal after the referees ruled the puck went in off a CC player’s stick after three-straight short-range shots by 19-9-8 Denver were blocked or turned away. The goal with 17:43 left knotted the score at 2-2. Terry later scored with 5:31 remaining for his second of the night and the game-winner. Denver found more open ice as the 15-16-5 Tigers tired. It showed on Terry’s tally with him able to lead a solo rush into the CC zone. He cut between defenders and fired a rising shot that beat Leclerc high stick side for the final margin. Haviland was not going to use fatigue as an excuse so much as give credit to Terry’s considerable NHL-ready talent. CC was in position to win its first NCHC playoff series after Tigers defenseman Kristian Blumenschein waited and then fired, beating Denver goalie Tanner Jaillet as traffic crossed in front of the Pioneers senior for the go-ahead goal with 2:20 left in the second period. The power-play tally, CC’s second in the series, put the visitors ahead 2-1. CC struck first when Trey Bradley forced a turnover by Ian Mitchell near the Tigers blue line. Bradley collected the loose puck in neutral ice after Mitchell fell and then cut across the slot, beating Jaillet with a soft backhander behind him after the Pioneers netminder went down to stop a fake on the forehand. The unassisted shorthanded tally with 3:19 left made it 1-0. It was the Tigers’ second shorty of the season. Things got more physical with Denver drawing a 5-minute major on Nick Halloran, who cross-checked Adam Plant in the helmet with 2:15 left. A flurry of penalties were called during the ensuing scuffle and set up Denver for an extended power play to end the first and start the second. That drew a chorus of boos and got the Magness Arena crowd into the game. They erupted when Henrik Borgstrom scored 2:06 into the second. He rifled a power-play shot into the upper corner against a screened Leclerc to make it 1-1 and end the CC sophomore’s shutout streak vs. DU at 150 minutes, 34 seconds, which included two straight wins. That Borgstrom goal was a product of a more sustained effort by the Pioneers to get bodies on front of Leclerc, making his life more difficult over the final two periods. Even then, Leclerc was almost enough for CC to pull off a series sweep before Terry took the game over. Nick Halloran scored twice in the opening period for his 12th and 13th goals this season. Colorado College sophomore Nick Halloran is one of three finalists for the National Collegiate Hockey Conference Forward of the Year award and one of three for the league Three Stars Award, while coach Mike Haviland received his first nomination as bench boss. Tigers sophomore goalie Alex Leclerc is also up for the Three Stars award. The finalists and nominees for 11 league awards were announced on Thursday. The winners will be announced and honores on March 15 at the annual NCHC Awards Celebration at the Science Museum of Minnesota in Saint Paul on the eve of the fifth annual NCHC Frozen Faceoff, and first at Xcel Energy Center. For most of the awards, finalists were determined based on voting by the conference’s eight head coaches with the top three vote-getters for each award (plus ties) being finalists. The Senior Scholar-Athlete Award nominees were submitted by and then voted upon by the conference’s Faculty Athletics Representatives (FARs). Athletic Directors at each NCHC institution had a vote on Herb Brooks Coach of the Year, as well, along with the coaches. Colorado College sophomore Nick Halloran, who finished second in the National Collegiate Hockey scoring race behind unanimous selection Henrik Borgström of Denver, was named to the all-league first team while junior Mason Bergh received honorable mention, aka third team. Borgström, a Florida Panthers draft pick, captured the NCHC scoring title with 33 points in 24 conference games (1.38 ppg), while tying for second in conference play with 14 goals, including two game-winners, adding 19 assists and a +6 plus/minus. Halloran finished second in the NCHC scoring race with 31 points in 24 games, potting 13 goals and handing out 18 assists, while leading the NCHC with four game-winners. Colorado College bounced back from an embarrassing home loss to end a 17-game winless streak against No. 2 Denver behind a 40-save shutout by sophomore goalie Alex Leclerc at Magness Arena on Saturday. The win in Denver pushed CC (13-13-4, 7-10-3-2 National Collegiate Hockey Conference) into sixth place ahead of Omaha (15-14-1, 8-12-0) and only two points behind No. 15 and fifth-place Western Michigan (14-14-2, 9-10-1). “Tonight really helped us put ourselves in position to get home ice,” coach Mike Haviland said. Colorado College played better as the game went on to put further pressure on the Pioneers as the early 1-0 lead held. DU pulled goalie Tanner Jaillet with about 80 seconds left but shot blocks by Westin Michaud (:20 left) and Troy Conzo (:08 remaining) helped the Tigers hold for their first win over Denver since Feb. 22, 2014 – a span of 1,424 days — and the Tigers’ first under Haviland. The victory ended a 17-game winless streak (0-15-2). Denver kept the puck in the CC end for most of the opening period, but it was the Tigers that entered first intermission with their initial lead of the weekend. Few at the time guessed it would prove to be the game-winner. Conference-leading scorer Nick Halloran (41 points) scored his 18th goal of the season on the power play with 29 seconds remaining for a 1-0 lead. The power-play tally ended on 0 for 14 skid over three games. In other NCHC action, No. 11 Minnesota-Duluth downed last-place Miami 3-0 for its second shutout of the weekend against the reeling RedHawks. It is the first time in program history that Miami has been shut out for three-straight games. The scoring drought is now at 212 minutes, 1 second dating back to the second period on Friday, Feb. 9 (5-2 loss to No. 3 St. Cloud State. No. 9 North Dakota bounced back for a road split by downing No. 13 Omaha, 3-0, and end the Mavericks’ seven-game home win streak. Cam Johnson returned to action after two games off to make his 11th career shutout (26 saves); second all-time at UND behind 15 for Karl Goehring. League-leading St. 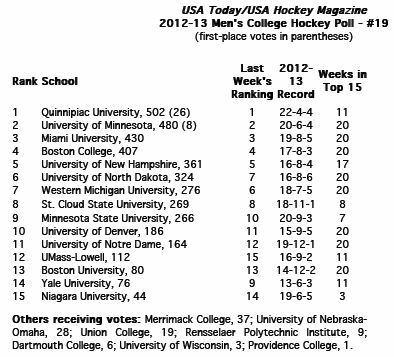 Cloud State, ranked third in the USCHO poll but tops in the Pairwise rankings, defeated No. 15 Western Michigan 4-2 for the road sweep. The Broncos fell into in fifth place. SCSU, which clinched home playoff ice on Friday, now has 45 standings points to second-place Denver’s 40, setting up a huge weekend series in Minnesota that will determine ownership of the Penrose Cup regular-season championship. UMD and North Dakota are tied for third with 30 points. The new/old blog will be much the same as Paisley Hockey and Eye of the Tigers before it with more Air Force and CC coverage since I am covering the teams full-time and even getting paid to do it now. That is good news for me and hopefully for college hockey fans looking for more news and links. The @Paisleyhockey Twitter account will continue with score updates and story links from around the WCHA and AHA and soon, the NCHC. I will also maintain my Paisley Hockey Facebook page as a convenient news feed to find blog updates, etc. I would also encourage CC fans to join the Colorado College Hockey group on Facebook where my blog updates appear regularly. Thank you all for following Paisley Hockey. Maintaining this blog kept me up to speed on college hockey even while I juggled freelance assignments. No doubt, that preparedness played a large part in me being rehired by The Gazette. For that and you all, I am grateful. Games for Thursday, February 21: USA Under-18 Team at Nebraska Omaha (EX), 7:37 pm CT.
Games for Friday, February 22: Minnesota Duluth at Minnesota (WCHA), 7:07 pm CT; St. Cloud State at Colorado College (WCHA), 7:37 pm MT; North Dakota at Denver (WCHA), 8:07 pm MT. Games for Saturday, February 23: Minnesota Duluth at Minnesota (WCHA), 7:07 pm CT; North Dakota at Denver (WCHA), 7:07 pm MT; St. Cloud State at Colorado College (WCHA), 7:07 pm MT. Games for Sunday, February 24: Penn State at Wisconsin (NC), 7:07 pm CT.
Games for Monday, February 25: Penn State at Wisconsin (NC), 7:37 pm CT.